Cheeky Chickpea Sidekick ia a delicious fresh side dish which will go well with any Mediterranean meals. Made of a base of chickpeas with a drizzling of olive oil, lemon juice, mint and red onion this side dish is quick, easy and cheap to make. 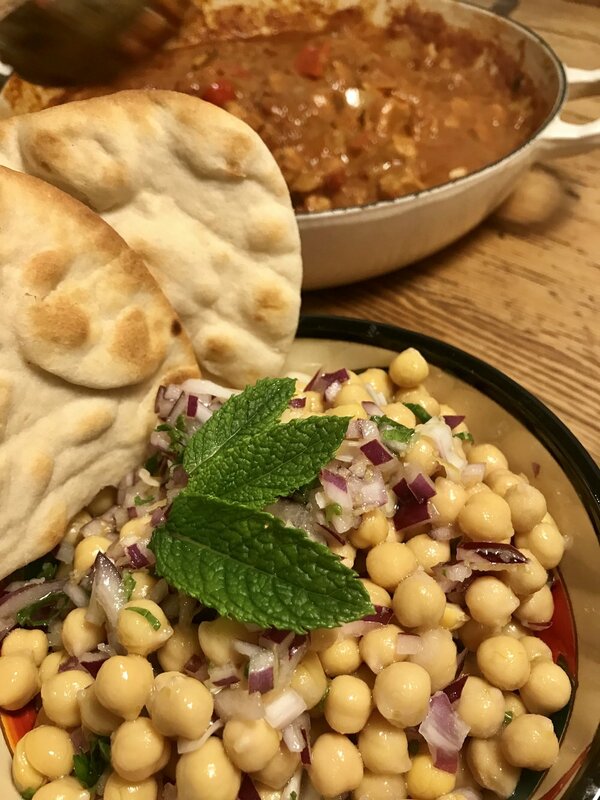 Cheeky Chickpea Sidekick is so yummy it could also be served as a salad with a few alterations or a quick and fresh snack served with a few pitta breads as shown in the picture. The dressing for this dish can be made well in advance and would go wonderfully with many other salads. This dish is gluten free, dairy free and vegan! Cheeky Chickpea Side kick is a fresh side dish to go with many summer dishes. Easy to make, quick and cheap this little dish can be eaten separately or as a side with a main meal. Wash chickpeas in a colander and let them drain while preparing the other ingredients for the dressing. Slice up the red onion, I diced mine, I would recommend keeping it to a dice or to fine slices. Chop up some mint leaving a few leaves for decoration. Zest the lemon and then squeeze the juice out. Mix the lemon zest, lemon juice, red onion and olive oil in a bowl then add the chickpeas. Season with some sea salt and more mint to the required taste. Serve in a bowl with some mint leaves on the top.